Besides the commitment to make excellent coffee, we also make our customers, our employees and our community a priority. 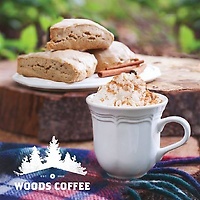 The success of The Woods Coffee rests on the ability to please each customer who either walks in or drives thru. It is our belief that each staff member has the ability to influence each customer in a positive way. In some cases even changing a customer's entire outlook on the day ahead. The commitment to excellence by well-trained staff has been a vital part of what is achieved each day at The Woods Coffee. All staff is asked to go beyond the ordinary and excel in the opportunities placed before them each and every day. The Herman family is committed to the growth of each staff member both professionally and personally. We are committed to buying local; from the milk in our drinks to the flour in our baked goods we want to invest back into our local communities. We also invest in others ways, that is why we donate countless cups of coffee, give monetarily to hundreds of different charities and organizations and volunteer in our communities. We want to make an impact in the community where we work and live, with the goal of impacting lives for good. And we want our company to do things which care for our environment. That is why our hot and cold cups are 100% compostable, made from biopolymer plants domestically grown in the United States.